This is a very special pattern to me. 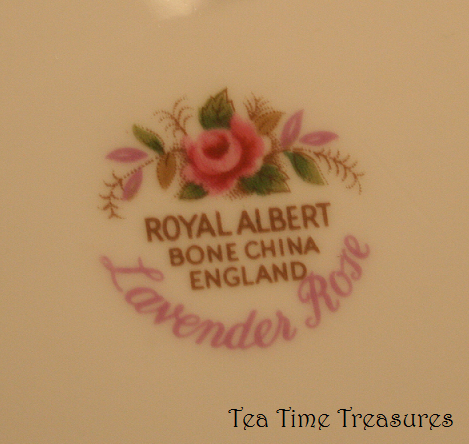 It is my Grandma’s pattern, Royal Albert - Lavender Rose. We often ate on it growing up when visiting my grandparents - on special occasions and on ordinary occasions. I attended a work Christmas party a few years back which included a white elephant gift exchange. Lo and behold! Someone brought a random smattering of Lavender Rose china pieces. Oh, how I wanted it!! Try as I might, as any good white elephant gift exchange goes, you never end up with what you want. Luckily for me, however, the final owner of the china didn’t really have a need for it, and re-gifted it to me a few weeks later. I told my Grandma all about my good fortune, and she was quite excited about it as well. The time came when Grandma and Grandpa had to downsize from house to apartment and then from apartment to lodge. Grandma knew of my love of fine china and so she bestowed upon me her precious pieces of china as her living space became smaller and smaller. Combining her complete set of china with my mix matched pieces has left me with some unique combinations. For example, I have 3 cream and sugars! Her final piece she hung on to was her teapot, as she so wished to serve tea in it when company came to visit. Then one day when I went to visit her in the lodge, she gave me her teapot. It had become too much work to make and serve tea from this teapot. Both Grandma and Grandpa are gone now, but they will always be close to me in memory. I will think of them dearly every time I set the table with this precious set of china, three cream and sugars and all. 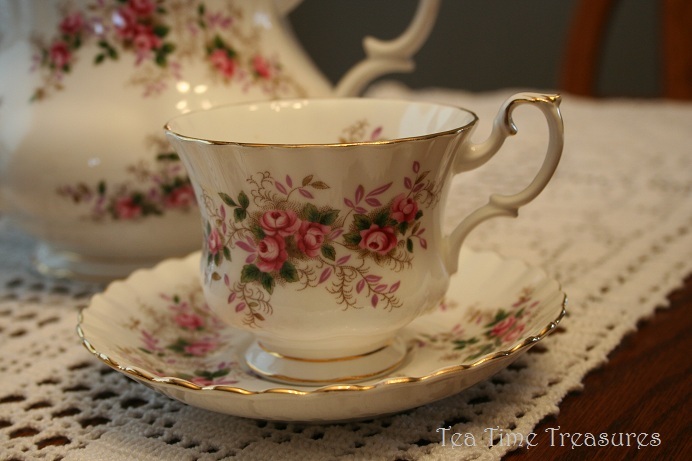 I believe this Royal Albert pattern was first introduced in 1961. The cups and plates are in the Montrose shape. Delicate pink roses adorn each of the pieces. what a lovely set and precious treasure you have! and am pretty sure you enjoy using this set! tea must be tasty when using this cup!.. this is one cup that I don't have in my collection. after seeing yours, I think I got to get one trio or duo too! thanks for sharing. have a great weekend!